The Dayton region is becoming synonymous with outdoor recreation. Our amenities — including cycling, mountain biking, boating, hiking, backpacking, horseback riding and ADA-accessible trails — are putting it on the map as the Outdoor Adventure Capital of the Midwest. Discover how easy it is to have an active — and healthy — outdoor lifestyle using your Five Rivers MetroParks! Hike more than 25 miles in some of the most spectacular woods, ravines and hills in Southwest Ohio. Combine your hike in Germantown and Twin Creek MetroParks with an overnight camping experience to make this gem of Montgomery County your weekend destination. Learn more about the Twin Valley Trail (TVT). Paddle from Eastwood MetroPark to RiverScape MetroPark and beyond. This popular 4-mile stretch will take you through the Mad River Run and RiverScape River Run, where you can stop and play in the wave features or cruise on through in the recreational boater passage. Learn more about regional water trails. Bike through the beautiful woods of Taylorsville MetroPark and enjoy the history of Tadmor Village and the earthen dam. Your ride on the nation’s largest paved trail network can continue north to Miami County or south to points in Warren, Butler and Greene counties. Tackle the dirt of MoMBA as you ride through majestic woods. This stacked loop system will allow beginners to work on skills on the flow trail and also lets experienced riders charge on out to the “The Talon” to take on this double black diamond beast. Eighteen targets await you and your disc golf friends at the Great Blue Heron Course at Englewood MetroPark. You will love the competition on this Dayton Disc Golf Association course. Learn more about the disc golf course. From calm eddies to whitewater, the fish habitat on the Mad River is rich and will challenge the most advanced angler; but it also offers a moving water environment suitable for beginners. 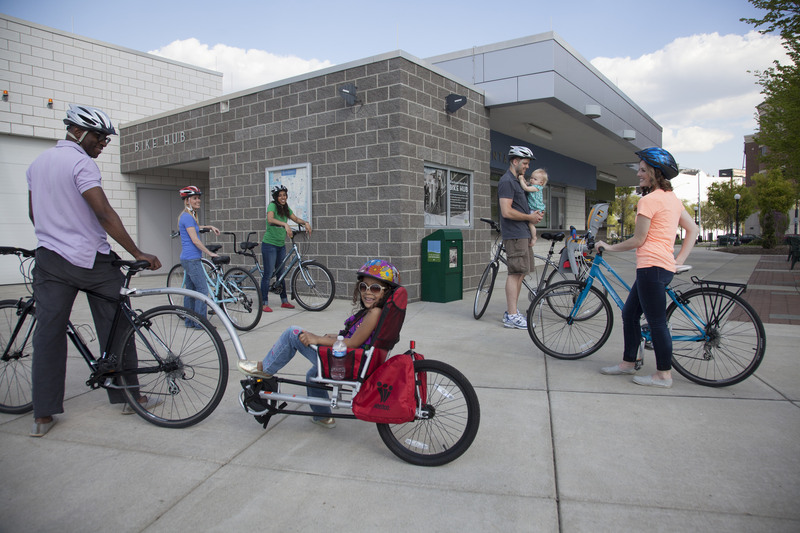 Rent bikes and child biking accessories to explore the region’s more than 300 miles of paved, connected bikeways. Learn more about RiverScape Bike Rentals.